Rains have reduced considerably over the state of Maharashtra; however, the state has not become completely dry. On the last day as well, light to very light rains occurred over parts of Vidarbha with light to moderate over Madhya Maharashtra. Parts of Konkan also observed light to moderate rains with one or two heavy spells. Mumbai also recorded some light rains. Meanwhile, most parts of Marathwada remained dry. 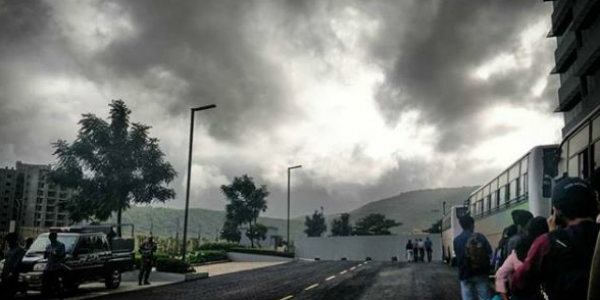 In the last 24 hours, from 08:30 am on Thursday, Mahabaleshwar recorded 50 mm of rains, Harnai 17 mm, Vengurla 9 mm, Mumbai 9 mm, Kolhapur 5 mm, Parbhani 3 mm, Nanded 3 mm, Parbhani 1 mm, Nagpur 0.2 mm, Bramhapuri 0.6 mm, and Sangli witnessed 0.3 mm of rains. As of now, light to moderate rains with one or two heavy spells is expected to continue over Konkan division. Parts of Madhya Maharashtra may observe some scattered showers. On the other hand, light rains may occur at one or two places over Vidarbha as well. However, Marathwada would remain almost dry. Places like Malegaon, Jalgaon, Aurangabad, Jalna, Hingoli are expected to remain almost dry for the next 24 hours. Moreover, the weather would remain warm and humid over the coastal areas. Farmers are advised to continue Bunding of rice field and remove all weeds on the bund. There is a possibility for the incidence of blue beetle and leaf folder due to cloudy and rainy weather, hence, spraying should be done with optimum quantity. In the wake of dry weather in Marathwada, farmers are advised to complete all inter-culture operations like weeding, and fertilizer application.